April 10, 2019 | 7:00 P.M.
Brene Brown says, “Empathy is simply listening, holding space, withholding judgment, emotionally connecting, and communicating that incredibly healing message of you’re not alone.” And while the concept is clearly conveyed, teaching empathy, as it applies to understanding history especially, is not quite as clear cut or simple. 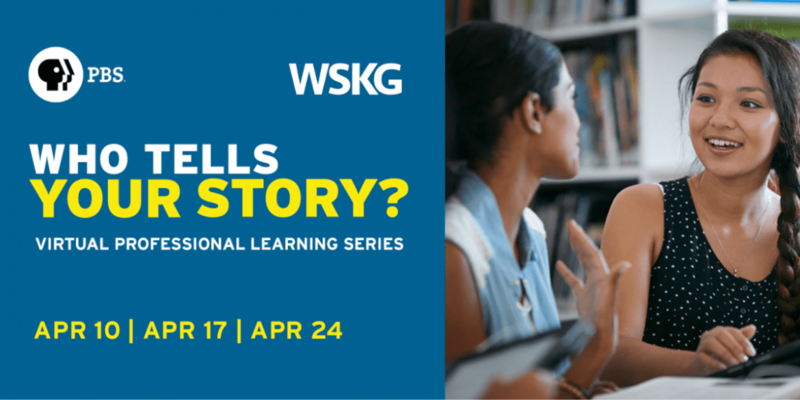 Teachers, we hope you’ll join us for the first of our three part series specifically for Social Studies educators, “Who Tells Your Story.” Through this exciting ‘live learning’ event, we’ll discuss how to cultivate inclusive spaces within your classroom so students can build a foundation for learning and inquiry that allows them to empathize with, and better understand, different perspectives. PBS Digital Innovator All Stars Shelly Stanton and Paige Somoza will highlight exciting resources and models that you can immediately implement in your middle/high school classrooms. PBS will provide a certificate of attendance for each one hour virtual professional learning event. If you are unable to attend live make sure you still register, we will send the recording and all resources. April 17, 2019 | 7:00 P.M. Whether you came to your answer quickly or it took you a few minutes you were likely able to identify a show, and you also probably have great reasons to backup your assertion. The better question is: why might your answer be more valid than the person sitting next to you? How about the person sitting next to them? As our students form their own opinions and beliefs, and think about their views in both contemporary and historical context, what tools and strategies are they using to locate and navigate credible sources? How are they effectively analyzing perspective? Join us for the second episode of our series designed especially for Social Studies teachers, “Who Tells Your Story.” PBS Digital Innovator All Star David Olson will highlight exciting resources and models that you can immediately implement in your middle/high school classrooms. PBS will provide a certificate of attendance for each one hour virtual professional learning event. If you are unable to attend live make sure you still register, we will send the recording and all resources! April 24, 2019 | 7:00 P.M. So far in this series, we have explored foundations that help students think about history, perspective, and credibility. In this episode, we’ll explore tools to help students craft and communicate their own stories. Are they sharing their stories in ways that build empathy, and convey authenticity? In our role as educators, what can we do to help elevate our students’ voices? In the final episode of our series, “Who Tells Your Story,” PBS ALL Star will be joined by student reporters from PBS News Hour’s Student Reporting Labs. This is definitely a conversation you won’t want to miss. PBS will provide a certificate of attendance for each one-hour virtual professional learning event. If you are unable to attend live make sure you still register, we will send the recording and all resources!